Thinking of a Mini Pet Pig? Meet Coccolino! ~ Pawsitively Humane, Inc. Thinking of a Mini Pet Pig? Meet Coccolino! Pets come in all shapes, sizes, colors and species.While most people have cats or dogs or even rabbits or ferrets as pets, one pet that is cute and cuddly and gaining popularity are mini pigs. Yes pigs! So the "cute" part you can envision. But if the "cuddly" adjective has you perplexed or wondering "don't they smell?" well...these are excellent questions! We turned to Katie Bastianelli who writes a blog of the adventures in raising a mini pet pig named Coccolino. We soon learned that pigs, like some cats, do not like to be picked up, but like dogs or other friendly cats, love to cuddle and are extremely intelligent. But mischief is clearly their main trait and so extraordinary patience is essential to accepting your mini pig. Soiled carpets and pirating of food vessels is standard routine. We asked Katie for a very candid story telling of her experience and we're excited to share it with you below. The stories will leave you laughing, wanting to scoop Cocco in your arms and also thankful for your own better behaved cats and dogs. Enjoy the adventures! Pigs are often equated to perpetual toddlers. They are stubborn, clever, loving on their own terms and always getting into mischief. We already had two toddlers in the house; what’s a third? Before our mini pig arrived, our brood consisted of me and my Italian husband (I met him in Rome and lived there for six years before we moved to upstate NY where I’m from), a sweet and sassy three year old daughter, a very attached and needy one year old son and three stray cats straight from the streets of Rome. Sadly, our one cat, perhaps the most social and affectionate of the three, passed away in February 2012. It was a very difficult time for me and my husband and our daughter still talks about her cat Giaccolo (pronounced jock-olo) to this day. After a few months, we still felt his absence and decided to bring home another pet. We couldn’t consider another cat and one of our remaining cats does not do well with dogs. The wheels started turning and after much research and discussions with several veterinarians, we decided on a pet mini pig. 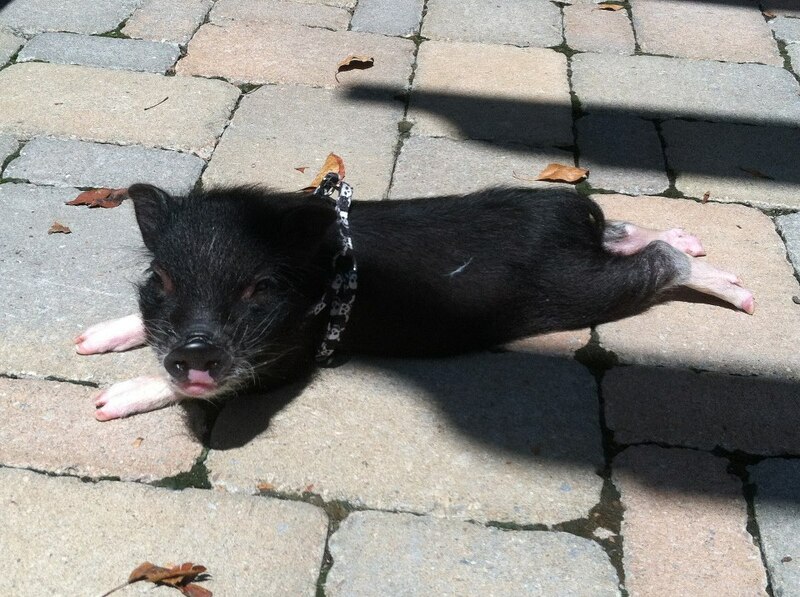 Our mini pig came to us in early July 2012 at barely five weeks old. He should have been nursing with his brothers and sisters and finding excessive summer warmth in their bodies but his mother turned him away. He was ready for his new home. Since all of our cats have Italian names and only understand the Italian language (rightly so, since they are Italian), we decided to give our pig an Italian name too. Coccolino (pronounced co-co-leeno) was chosen since that means “cuddle bug” in Italian and we were hoping he would be just that. Our rejected runt was not a “coccolino” when he came to us. He was the exact opposite. He caused quite an ordeal in the beginning, so much so that we weren’t sure how we could manage having a pig, especially with such young children. Even our two cats Lacci (pronounced lah-chy) and Pizzico (pronounced peets-ee-co) weren’t sure what to make of the high pitched squeals emitted from this tiny pig. Needless to say, our daughter was not a fan of the pig’s shrieking and our son was overly jealous that his Mom was holding anything but him. The first few weeks were nearly impossible trying to get everyone happy – and quiet. After extensive training and patience, Coccolino settled in and finally began to live up to his name. Even the cats became curious once he quieted down. They would sleep next to him and Cocco would obediently hold still so they could sniff him. Cocco always showed deference to Lacci, the top pig in Cocco’s herding-order mind. Lacci seemed to respect this. Pizzico, always a sweet but timid cat having been hit by a motorcycle when he was a few days old, gets along with any animal he encounters. The three of them quickly formed a working balance. Although we found an equilibrium in our house of kids, cats and pig, life with a mini pig is never that easy or uneventful. Pigs are smart, often considered the third or fourth smartest animal, and they will test you. The toddler quickly emerged from the shy and scared mini piglet that came to us. And, as we are finding out months later, he does not appear to be transcending this stage in childhood. We have experienced more frustration in the past few months than we ever have before. Coccolino still shrieks when someone approaches him, still can only be picked up by me and continually discovers innovative ways to achieve his goals (again, food and warmth). If it weren’t so infuriating to deal with the aftermath of his skillful work, it would be impressive. His tact for overturning garbage cans, opening cabinets and urinating wherever suits him has disrupted our lives and made us question our choice of pet on almost a daily basis. Still, the cuddles and kisses Cocco shares with us has us helplessly at his mercy, begging him to stop causing so much trouble and live by the rules but accepting him even though he refuses. We could not imagine life without our mini pig yet cannot quite get used to all the newly situated baby gates we thought we were done with and putting our garbage can on top of our counter when we leave the house. Cocco always find a way to food! Pigs are a lesson in balancing the endearing with the exasperating, the heart melting kisses with the pile of poop in the living room. Everything they give in one way (cuddles), they take in another (usually resulting in a huge mess). They will show you as much love as mischief and will definitely be a perpetual toddler…for a good 15 years…but they will also be the cuddliest pet you could ever imagine. A pig will sacrifice anything in the name of food. Never leave food packages accessible. Accessible means in a paper package they can easily tear open, knock over (garbage) or on any level low enough to get into (cabinets). A pig will seek warmth any way they can get it, be it dog, cat, heating vent or under your sweatshirt. Pigs communicate in many noises beyond squealing and grunting. They do not oink. Pigs do not like to be picked up. Maintaining a pig is easy since their health is excellent overall; maintaining patience to have a pig is trying. It is possible to feel love and frustration in equal measures. I hope this article hasn’t turned you off to pet pigs. They are extremely intelligent and affectionate and a pig might be the best pet you’ve ever had. Rather, I hope this article was an educational glimpse into all the chaos – and love – that coincide with having a pet pig. Thank you Katie for sharing your story! There are highs and lows in raising and disciplining children and pets. The more knowledge we attain, the better equipped we are to handle the mishaps and appreciate the fruits of our labor--happy, healthy pets and children. To learn more about the responsibilities of caring for a mini pet pig, follow Coccolino's adventures at www.myminipetpig.com. 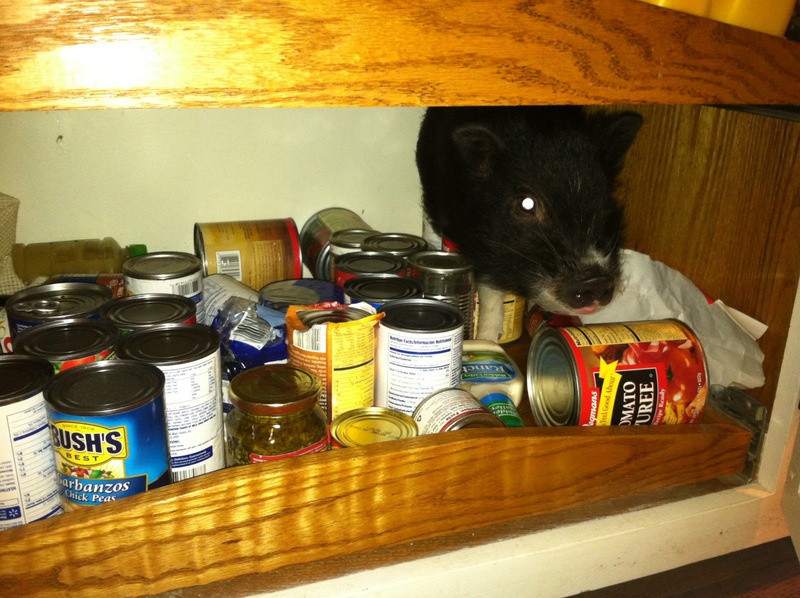 We love that Cocco and sure enjoy those adventures in cabinet surfing! Thanks so much for asking us to write a piece on our piggy and for sharing it with your readers! We follow Cocco and just love that piggy!! We love this pet piggie! I love that baby picture too, priceless! We love reading Cocco's blog and we loved reading more about Cocco here on this blog. Thanks for posting about him! We follow Cocco's blog and LOVE it!!! We have a mini pig the same age as Cocco and it's nice to know that someone else out there is going through all of the same things that we are. There's nothing like a pet pig and we wouldn't trade it for the world!!!!! 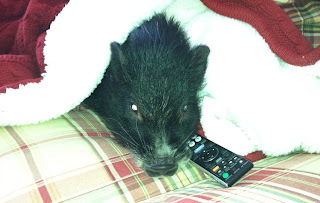 Hi Katie: I am almost sold on getting a mini pig...don't know what Nylablue would thik tho'!!! Oh, Cocco!! Do t you k ow how lucky you are?? Be nice to you mom; she is wonderful! Great honest and enlightening article. Will help people with deciding on a pet mini pig. Thanks for sharing.